HMNS’ revamped Welch Hall of Chemistry explores the natural sciences through the lens of chemistry. Our goal was to create a world-class chemistry hall which satisfies and provokes the interest of visitors of all ages and levels of chemical experience, young and old, beginner and expert. The exhibits in the new Welch Chemistry Hall were intensively designed to captivate. Interactive exhibits use “directed play” to invite visitors to experience phenomena by allowing them to change several parameters, instead of simply pressing a button or watching an effect. The newest computer technology brings visitors to the molecular level, letting them electronically “change” the arrangements of atoms in molecules, which results in completely different chemical properties. Interactive exhibits using huge touchscreens give an immersive experience and include molecular dynamics simulations—the tools that scientists actually use in the laboratory to understand the world at the tiniest scales. We drew from the amazing work happening right in our backyard, at the Houston Medical Center, Rice University, the University of Houston, and the Houston chemical industry. Houston area chemists are featured prominently in the hall and teach visitors what it’s like to be a chemist or chemical engineer, how chemistry affects everything we do, and how the newest chemical technologies are going to change everything from cancer therapies to the next generations of smartphones. The Welch Chemistry Hall is unique in that it brings to life the story of the natural history of chemistry, from the formation of elements in the big bang, to the chemistry of life. Visitors will explore the creation of matter from its earliest moments, as well as the self-assembly of virus particles from their individual proteins. 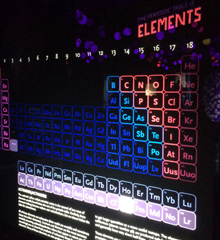 Other novel exhibits include a “directed play” module on the interaction of molecules with light. Called “Shining a Light on Molecules,” it lets visitors literally zap molecules with light and see how different colors of light can do very different things to them. Finally, visitors will test their crime-fighting skills in a “Chemistry Crime Lab,” where they will learn how chemistry is used to solve crimes and the parts not seen on television dramas.